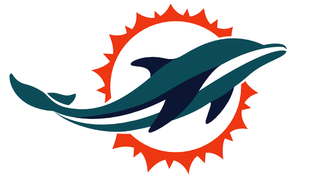 It never did make sense that the Miami logo showed a dolphin wearing a football helmet, when a dolphin is the one NFL mascot that would be suffocated by wearing a helmet. But as part of a rebranding effort to leave behind years upon years of losing—Gloria Estefan! Stadium renovations!—the Dolphins will be introducing new uniforms and a new logo for the 2013 season. Last month, the Dolphins held a web weekend for bloggers, and CEO Mike Dee spoke a little bit about the new logo. It would be "a mix of modern and retro," and navy would be an accent color. Fast-forward to this past Sunday. DolFansNYC, a site for expat Miami fans, posted a blurry cellphone photo of a potential new design. It's of unknown provenance, but when shown to a friend who works for Nike, that friend confirmed that it was "very very close" to what the final logo will be. And this morning, Paul Lukas of Uni Watch, posted the clean version of the logo that you see above. Lukas doesn't know if it's legit, but the fact that he's obtained the same design that DolFans did, presumably from another source, at least points to this being more than a fanmade logo circulating on Facebook. There hasn't been a team logo in recent memory that hasn't "leaked" before its official release date. With the Dolphins season ending in four days, it's almost time to start selling merchandise and season tickets for 2013. Expect a formal unveiling within a few weeks.